It’s no surprise that you want to learn how to win at poker. Poker is a great game – it’s fun to watch, read about, study and most fun to play. Whether it’s with friends casually or for serious money almost everybody has played a few hands in their lifetime and realised the excitement of poker. There comes a point for everyone where you want to turn a corner, take it more seriously and become a winning poker player. There’s a big difference between winning once or twice and winning consistently for a long period of time. There’s different motivations for everyone, some people just want to make money and others want to prove they’re the best. Whatever the driving force is you’ve made the conscious decision to get better. 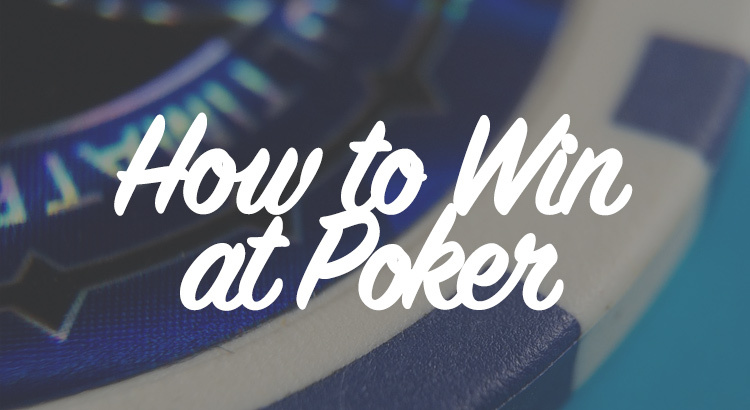 It’s time for you to learn how to win at poker. There’s no quick trick to winning at poker, in fact it can be a long hard road. Most of this takes place behind the scenes and the strongest players make it look easy. It’s about mindset, work ethic and being able to implement knowledge. A small winning result from me (Luke) generated from a free satellite seat. …and indirectly; some of our closest friends have live cashes that total over $800,000 (source: The Hendon Mob). Understanding the rules and basic poker strategy is just the first step, to make money you’ll need to develop some specific skills and develop yourself as a person too. Like it or not, poker does come down to maths. There’s a lot more to it than we discuss here, but you do need to understand at least the basics. There’s pot and stack ratios, equities, EV and so on and you have to know what each of these mean and how to use this knowledge effectively. You don’t need a maths degree. Have a look around the forums, any training sites or any poker material around and you’ll get a crash course. Use everything you learn to determine what your opponents are doing and what you should be doing. So many times we hear of poker pros going broke that we assumed had millions in the bank. Ultimately they’ve fallen at the first hurdle and variance has chewed them up and spat them back out. Just because someone wins $1,000,000, it doesn’t mean that’s how much profit they have. Far from it. Chances are, they already owe people money via ‘make up’, they will owe people percentages through ‘selling action’ (which is a great way to reduce risk and variance) and of course they will have lost money in tournaments prior to the win. You have to know what your bankroll is and what you can afford to play. Even if you’re the best player in the world, you risk going busto if you don’t abide by the golden rules. Most commonly people advise having 50-100 buy-ins (with 100 big blinds per buy-in) for cash games and only spend 1% of your bankroll on a single tournament. This means if you’re playing stakes of $1/$2, you should theoretically have a bankroll of $20,000. Yeah, tougher than you thought, right? These are the levels of funds you need if you want to be a winning player. If you can’t afford that level of investment right now then you need to lower the stakes and grind your way up. For more information about when to move up and down in stakes then look at the Kelly criterion which gives a useful breakdown. Choosing the right style or format of game is crucial for winning players. You have to work out what you’re best suited for, or most comfortable playing. The main choice tends to be between cash games or tournaments, but you could look into playing pot limit Omaha or another variety of poker. While it’s true the best players in the world are generally multi talented, you really are best off focusing on one type at first and getting as good as possible in that format. Game selection does not just mean the actual game you’re playing (i.e. Hold’Em, Omaha etc. ), it also means deciding which tables are profitable for you or not. For cash game players you can scout out the table before hand and see who’s there. If it’s 5 pros you might want to avoid it, however if there’s some recreational players you’re likely to see some good results. Don’t get dragged into proving yourself by butting heads with top players as it’s not likely to end very well. The true greats of the game are calm and composed under pressure. Poker is a pressure game. There’s stress if you win, stress if you lose and your body responds in certain ways. In order to win, you have to try and put aside these emotional states and think rationally and logically. If you aren’t able to stay in control you’re likely to tilt and spew off chips to opponents. Ego has been the downfall of many good players and is often the root cause of tilt. Losing pots you should have won can be very annoying, especially if you’re stuck in the session. A lot of top pros use yoga or exercise to stay balanced and calm, but the first step is accepting the variance of poker. Even the best in the world lose sometimes, it’s essential you stick to the long term thinking! Losing with aces all-in pre-flop is never a nice feeling, but it’s important you remember that if you got all the money in with the best hand at the time then you made the right – i.e. most profitable – play (with very, very few exceptions, but let’s not confuse things in this post). You have to stay hungry to learn and stay humble. If you think you’re the best you’ll stop the hard work and education side. There’s no quicker way to become mediocre and lose your edge. Top players are smart cookies. They know more about hand ranges, equities, EV and everything poker than ever before. Top level poker is super competitive so you really have to be working hard. Thankfully there is more information than ever before readily available. There’s training sites and free content. Forums can be particularly useful for solving issues in your game. There are plenty of great YouTube channels out there too, that will walk you through hand histories that allows you to pick up new information free of charge. There is so much out there about fundamentals of poker that there’s no need to go into too much detail. It’s basically about hand selection, when to check, when to bet (and with what bet sizings). You need to know this before playing in the games as it’s the nuts and bolts of poker. Great players go off script from fundamentals, but for good reason. Learn the basics before you implement the complicated! Styles change all the time. Back in the day the motto was “always see a flop”. Re-raising and re-re-raising became common in an era of hyper aggression, which was profitable but the variance was wild. Nowadays, it’s more essential than ever that you know when to play tight and when to play aggressive. Games and styles change regularly, so it’s important to keep your finger on the pulse with what is going on in the poker ecosystem. It’s also useful to know if specific strategies have made their way into the mainstream and how you can adjust for it. It’s always worth noting what the superstars and pros are doing by watching live streams or the TV when it gets mainstream attention. Often their tendencies will trickle down to the lower stakes and influence the styles. It’s a great excuse to watch videos and keep up to date with the big names of the game as research. Once you’ve figured out the fundamentals and how people are thinking and playing at your table, you need to work out the best way to play your games. Dig around and see how people are playing your variety specifically. It’s important you know the strategies for the format you’re playing. If you’re playing cash games then sit-n-go tournament training won’t really help you, and vice versa. Work out the best way to approach your games and keep adjusting to the other players. Also remember to be aware of how your play looks at the table – if you’ve had a prolonged period of aggression, your bluffs are more likely to be called. With research it’s always important to look in the right places. There’s a LOT of information out there so make sure it’s credible. The last thing you need is a big loser in the game giving you advice. I’m a big advocate of playing online if you’re serious about poker. Even if you’re looking to grind live, you’ll be able to get such a vast amount of experience in a short amount of time by playing online. The volume you can put in will mean you’ve experienced a lot of different situations and hopefully learn how best to react in certain spots. Winning online is tougher than it’s ever been. Lots of people are grinding for a living and there aren’t many recreational players donating money anymore. To win at online poker you’ll need to work not only on your playing style and maths but develop ways to constantly improve. Heads Up Displays (HUDs) are one of the biggest poker developments that have ever come along. They track data on opponents and map out their tendencies so you can see who’s aggressive, who’s tight etc. To win at poker you need to get to grips with a HUD and understand how to use it most effectively, because everybody else playing already has and you don’t want to be at a disadvantage. Along with the HUD there’s a large database that tracks your results. This will show you where you are winning, what hands you’re losing with and a whole host of other information. It’s a really useful and basically essential tool if you’re going to beat other players online. There’s a lot of other software to help you in the games (like TableNinja that helps you multi table). A lot of it is pretty inexpensive and works out as a good investment if it can help you win. Grinding online is good practice and really great for your poker knowledge. Combine it with plenty of research and you’ll become very comfortable very quickly. Live poker is poker that is played in person, usually at a casino. The game is the same but the styles used are very different. There tends to be weaker players, but we play startlingly few hands in comparison, which limits winning players. How many hands of live poker do you play an hour? This can be tough to deal with – especially if you’re used to the ridiculously fast paced zoom games online – and it can lead to impatience. Impatience leads to mistakes and you can end up losing quickly. Be prepared to bide your time to avoid playing silly hands in silly ways, and to avoid going on tilt. Live poker has a lot more going on at the table compared to the online variant of the game. You’ll find people talk, joke and can even be rude to you or others. There’s also a lot more physical information available. It’s worth brushing up on your poker psychology and live tells before going to your local live game. Make the most of the information available, but remember not to give anything away yourself if possible! It’s not just about the way their body looks, or what they’re doing with their arms, hands or face, but listen to what people are saying – or how they’re acting. A long period of looking distressed before going all-in is known as ‘Hollywood-ing‘ and is often bad acting (and a sign of a very strong hand). Poker is a game played by people. If you take the time to really understand your opponents and can apply your knowledge and research then you should start to book some healthy wins. To be successful at poker takes a lot of the same skills as being successful at anything. You have to apply yourself and it takes time, effort, energy and discipline. The most important element of becoming a winning poker player is your mindset. Poker takes long term thinking. A good player can lose in a session or for a very long time. A bad player can win for a long time. It’s why it’s very important to keep a healthy bankroll and never take anything for granted. You have to stay focused on the long term and always make decisions, both on and off the felt, that will benefit you in the long run. Once you’ve got some experience of the highs and lows of the game, and really understand long term EV, then you can turn a corner. From there it’s all about building on your experience and knowledge and continuing to improve. With this mentality the hard work comes a lot more easily, but don’t be fooled, It is hard work and dedication that will make you a winning poker player. There’s good money to be made but It won’t be easy. The old saying rings true, “it’s a hard way to make an easy living”. Good luck out there and keep working to become a winning poker player! I'll send you my latest & greatest FREE tips, not too often, for getting more value from your bets.